In The Jews of Hungary, Professor Patai creates a pioneering, panoramic view of the multidimensional history of his subject from Roman times to the present. The Jews of Hungary is the first comprehensive history in any language of the unique Jewish community that has lived in the Carpathian Basin for eighteen centuries, from Roman times to the present. Noted historian and anthropologist Raphael Patai, himself a native of Hungary, tells in this pioneering study the fascinating story of the struggles, achievements, and setbacks that marked the flow of history for the Hungarian Jews. He traces their seminal role in Hungarian politics, finance, industry, science, medicine, arts, and literature, and their surprisingly rich contributions to Jewish scholarship and religious leadership both inside Hungary and in the Western world. Patai's main focus within the overall history of the Hungarian Jews is their culture and their psychology. Convinced that what is most characteristic of a people is the culture which endows its existence with specific coloration, he devotes special attention to the manifestations of Hungarian Jewish talent in the various cultural fields, most significantly literature, the arts, and scholarship. Based on the available statistical data Patai shows that from the nineteenth century, in all fields of Hungarian culture, Jews played leading roles not duplicated in any other country. Patai also shows that in the Hungarian Jewish culture a specific set of psychological motivations had a highly significant function. The Hungarian national character trait of emphatic patriotism was present in an even more fervent form in the Hungarian Jewish mind. Despite their centuries-old struggle against anti-Semitism, and especially from the nineteenth century on, Hungarian Jews remained convinced that they were one hundred percent Hungarians, differing in nothing but denominational variation from the Catholic and Protestant Hungarians. This mindset kept them apart and isolated from the Jewries of the Western world until overtaken by the tragedy of the Holocaust in the closing months of World War II. Raphael Patai (1911-1996) was a prominent cultural anthropologist, historian, and biblical scholar of international reputation. He was the author of more than three dozen books on Jewish and Arab culture, history, politics, psychology, and folklore. In The Jews of Hungary, Professor Patai creates a pioneering, panoramic view of the multidimensional history of his subject from Roman times to the present. His frank yet compassionate narrative will be greatly appreciated by scholars for whom this carefully prepared vast work will become an indispensable source of information as well as a valuable psychological perspective on Hungarian Jewry. 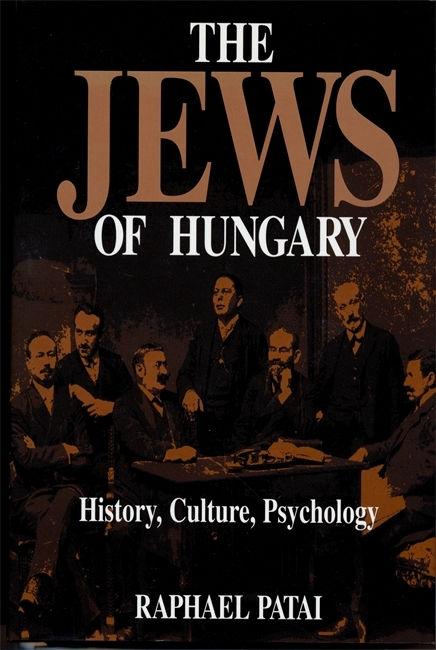 In addition, Jews of Hungarian provenance will have a unique and pleasurable opportunity to have an eminently qualified guide to lead them on a journey into the realm of past learning and personal experience.